Publisher: Ruth Nyaboe May 29, 2018 This information is provided solely as a guideline. 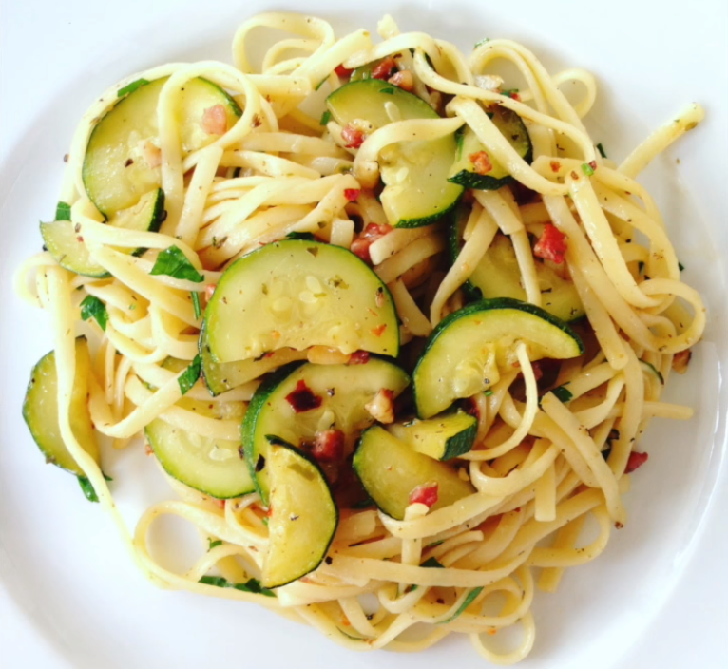 A simple and speedy pasta with the goodness of zucchini and flavors of parsley, chilies, and garlic. So yummy! I made this tonight for my roommate and my vegetable-hating boyfriend, and even he enjoyed it! ⏩In a pan heat olive oil and add the yellow and green zucchini to it. ⏩Add the green chilies and bashed garlic and fry lightly. ⏩Slice the stalks of the spring onions and add to the pasta. ⏩Roughly chop a big bunch of parsley. ⏩Season the frying zucchini with salt and pepper. ⏩Add 2-3 basil leaves, some of the chopped parsley and check seasoning. ⏩Cook the pasta of your choice in boiling salted water until soft and cooked. ⏩Add the cooked pasta of your choice to the zucchini and stir fry a little. ⏩Transfer to a bowl and garnish with grated parmesan, chopped parsley, and basil leaves.